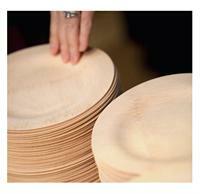 NOT PLASTIC PLATES-Veneerware Bamboo*** NO RETURNS - Wedding reception supplies and wedding place settings for every size reception with Divine Disposables! This plate is gorgeous. I have been using it for various projects and it always gets a lot of attention. This year I used it for a Fall Wedding and Thanksgiving video I did and have posted to my blog www.divineweddingideas.com . Take a look. “Our answer to the paper plate. Ideal for indoor and outdoor use. A sturdier, more beautiful, environmentally friendly alternative. Peeled directly from the bamboo stalk, bambu All Occasion Veneerware® products are innovative and highly versatile. The Story Begins Here….and Ends Here. We are sharing the ‘back story’ of our bambu All Occasion Veneerware® bamboo plates and cutlery with this visual depiction with the help of artist, Arlene Birt, to illustrate our ‘Soil to Soil’ full cycle story. The simple graphic style presents our story that begins in the hills of China that we fondly refer to as ‘bamboo mountain.’The bamboo we use is grown in the wild, not from plantations. Small plots of land are leased to individual farmers who harvest the bamboo with simple hand tools. The bamboo is harvested after three to five years. Our bamboo is harvested using sustainable farming practices. No pesticides, fertilizers or chemicals are introduced to the growing or harvesting of the bamboo, which is grown in the wild. bambu is the only company to be able to make the claim that our bamboo is organically grown and certified. Read Inhabitat’s Compost Report on our bambu Veneerware® by clicking here. All Occasion Veneerware®has also been recognized with the industry’s first BioBased certification granted by the USDA. Biobased products are preferred over others, because of their proven biodegradability and low environmental impact. Serve your next event, safe and clean, and certified green. Spring is here and that means more catered events. 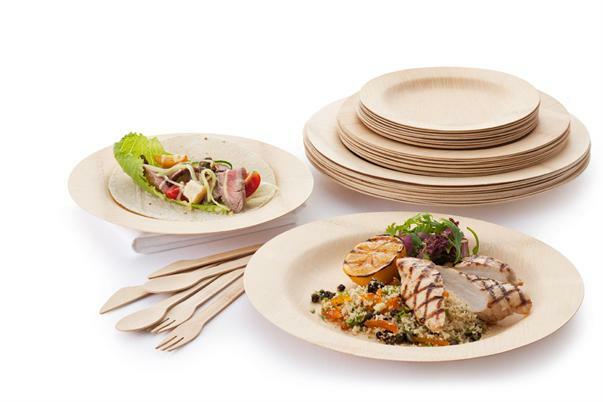 bambu Veneerware is the ‘natural disposable’ tableware of choice if you want to have the best green and sustainable option. bambu Veneerware offers several advantages. bambu All Occasion Veneerware® has earned USDA 100% BioPreferred designation. The government is encouraging businesses to use of approved biobased products. Biobased certification is the latest initiative to promote green products. Read more about Biobased Products, what it means and why it is important. Read more about Biobased products here (link). Seventh Generation also offers some Biobased products. They talk about Biobased products here at this link. bambu has earned 100% Biobased designation for its products. You are going to be hearing more about Biobased Preferred. Approved for Composting too. Naturally. We are endorsed and officially approved by Cedar Grove Composting, the largest composting facility in America. No other bamboo or leaf dinnerware product has earned this approval rating from Cedar Grove. Cedar Grove is the largest commercial composting facility in the USA.